mark British Astronaut Tim Peake's first orbit of the Earth - premiering at London's Science Museum. Watch it on Vimeo and YouTube. Join Riley for a Q&A screening of "The Fear of 13" at the Curzon Bloomsbury at 7.30pm. Riley launches his new Facebook campaign on Sky News for a final message to be sent to the Voyagers. Read a review of "The Fantastic Mr Feynman" here. The Fear of 13 to play the CPH DOX in Copenhagen. Riley's new film 'The Fear of 13' premieres at the London Film Festival. Riley calls for a final message to be sent to the Voyager. Trailer for "The Fear of 13" released today. Riley launches his new book on the Voyager Missions - at the Encounters Festival in Scotland. Riley's doc "The Girl who talked to Dolphins" is nominated for a Grierson Award. Tickets go on sale for Riley's "In the Shadow of the Moon" talk next month at the Winchester Science Centre. Riley's new four part series "Survival in the Skies" coming to MIPCOM. Riley's latest feature doc "The Fear of 13" to premiere at the 2015 London Film Festival. Riley's 2015 Nat Geo doc Hubble's Cosmic Journey nominated for an Emmy. Riley talks to UK Space Agency CEO David Parker for Space News. Pre-order Riley's new book on the incredible Voyager Missions at Amazon. Riley's Nat Geo doc Hubble's Cosmic Journey released on DVD. Riley's new film "Hubble's Cosmic Journey" airs across National Geographic Channel's global network. Riley's guest reporter spot broadcast on the Sky at Night, BBC FOUR. Riley is in the Faroe islands for the BBC's coverage of the Total Solar Eclipse on Stargazing Live. Riley's 2014 BBC film 'The Girl who talked to Dolphins' - nominated for an RTS award. Riley's new short film for Vodafone's #firsts campaign released. Watch it on YouTube here and on Facebook here. telescope's 25th anniversary. Press release here. Riley's film 'The Girl who talked to Dolphins', nominated for a BAFTA. Moonwalk One showcased in new Land Rover/Virgin Galactic - dawn of a new partnership commercial. Moonwalk One - the director's cut - released in France for 45th anniversary of Apollo 11. Network premiere of 'The Girl who talked to Dolphins' at 9pm on BBC FOUR. World premiere of my new film for the BBC'The Girl who talked to Dolphins', at the 2014 Sheffield International Documentary Festival. Watch more clips on the BBC's YouTube Channel. Listen to my BBC Radio 4 documentary on the new land grab for the Moon. Special screening of First Orbit at Life on Mars an event at 3Space in London. Reflecting on the implications for global collaborations, following events in the Ukraine, with the Youth Information Agency. Working with Egypt's Famelab finalists near the Red Sea. Reflecting on the spiritual gifts of our exploration beyond the Earth, as part of theUniversity of Kingston's Lent talks. Celebrating Yuri Gagarin's 80th with Russian Today. My 2011 film Space Shuttle: the final mission airs on BBC FOUR. Read my biography of pioneering female physicist Joan Feynman. Talking about ESA's Rosetta mission withTarek Bazley on Aljazeera. Recording my new documentary on the Moonfor BBC Radio 4 in London with Sue Nelson. The World Congress of Science and Factual Producers in Montreal celebrates my Feynman biography. Principle photography on my new film for the BBC 'The Girl who talked to Dolphins' - begins in the US with DOP Matt Pinder. BBC WorldService interview about comet Ison. Presentation to UK Sport's World Class Performance Conference 2013, on the lessons learnt from our exploration beyond Earth. Join my Kickstarter campaign to make our new animated web series 'The Apollo Fact Files', for YouTube. My Feynman doc airs on the Science Channel in the US - called Feynman: The Challenger. My short film 'The Road' hits 50,000 downloads on Vimeo. Unique screening of 'Apollo Raw and Uncut' atFrequency 2013 - Lincoln's Digital Culture Festival. My new biography of Joan Feynman, is out forAda Lovelace Day. Mon Dieu released to mark the 50th anniversary of the death of Edith Piaf. Staring the brilliant Lorraine Brunning, and directed by the equally brilliant Rufus Stone. Watch my new short film The Road made over three years, using over 4500 photographs taken on a bike ride from London to Bangkok. Microwave new media arts festival in Hong Kong screening of First Orbit. Wonderful screening of 'In the Shadow of the Moon' in Kaunas at the Lithuanian Science Festival 'Spaceship Earth'. Reflecting on Voyager 1's exit of the heliosphere with the BBC's Jonathan Amos, and on the BBC World Service show Newsday. Fun morning with the RegentTweet folks at the Apple Store in Regent Street giving a talk on how the twists and turns of the 20th century brought us our social media technology of today. Great reception for our new film 'Fear of Thirteen' screened, as a work in progress, at this year's Sheffield Doc Festival. Stephen Fry adds his praise for 'The Fantastic Mr Feynman' on twitter. "Richard Feynman documentary on BBC TWO Utter Bliss"
Review of my film 'The Fantastic Mr Feynman' in the Telegraph. I reflect on astronaut Chris Hadfield's impact on the world, on AlJazeera. 'The Fantastic Mr Feynman' trends higher than 'BAFTAs' on Twitter! I joined the marvellous Robin Ince at the Bloomsbury Theatre to celebrate what would have been Feynman's 95th birthday to preview some clips from my new biopic of Feynman. Read physicist John Butterworth's account of the day in the Guardian. The great Philip Sheppard - composer on my film 'The Fantastic Mr Feynman' previews some of his wonderful tracks. Read my article Richard Feynman: Life, the universe and everything in today's Telegraph. Come to my lecture on the Apollo Lunar Rover at the British Interplanetary Society, in London. Come to my talk on structuring stories at BBC Bristol. My latest book for Haynes - Lunar Rover - an owner's workshop manual is released to mark the final drive of the rover on the Moon. Producer/Director - Neil Armstrong - first man on the Moon, Darlow Smithson, BBC TWO. Writer & Presenter, For All Mankind, BBC Radio 4. 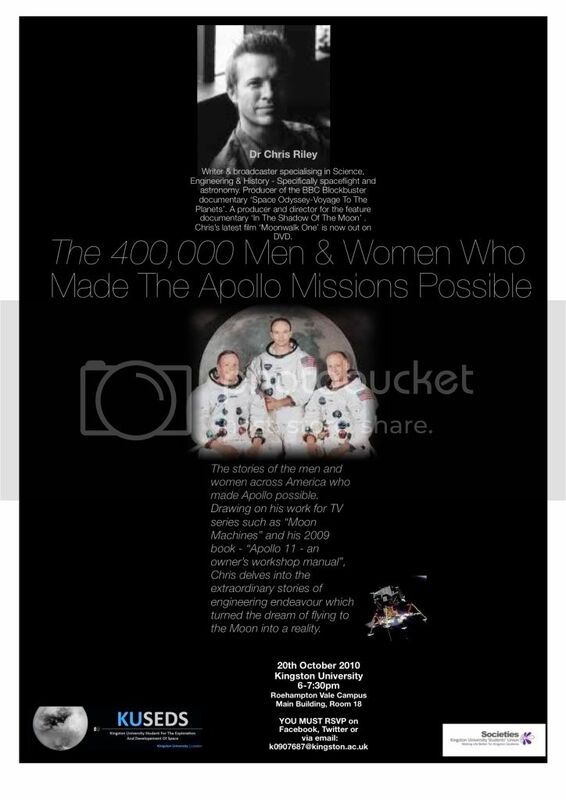 Author, Apollo 40 years on - how the moon missions changed the world for ever, Observer. Author, Voyager - the space explorers that are still boldly going to the stars, Observer. Guest Speaker, Gravity Fields festival, Grantham. Producer/Director - Voyager - to the final frontier, BBC Scotland. Consultant, Regent Street Social Summer, Sister. Producer, Additive Manufacturing Series, University of Sheffield. Tutor, Story Workshop, University of Sheffield. Communications Consultant, Department of Geography, Kings College, University of London. Invited speaker - The Cheltenham Science Festival, The Making of First Orbit, June 11th 2011. Guest - BBC Radio 4 - The Infinite Monkey Cage. 'So you want to be an astronaut'. Download the podcast from the 13th June 2011 here. Cone Crater, a new video installation piece to celebrate the 40th Anniversary of Apollo 14 - a collaboration with the creative science agencysuper/collider which open at The Book Club, London, January 31st 2011 as part of Apollo's End. Panel Member, Mars Symposium / 'Mission to Mars' play, Unlimited Theatre Company, Polka Theatre, October 8th 2010. Executive Producer, 'Destination Titan', Stephen Slater Productions & 483media, The Open University. Producer, The1second Film, for the Collaboration Foundation. Invited speaker, NC3R workshop, 11th November 2009. Co-author with John Olsson - An analysis of the recording of Armstrong's statement on stepping on the Moon in July 1969.